The meat and potatoes of the B&T Assembly & Packaging Division, our assembly packaging services, give you flexible options for putting your package together. We can handle all kinds of requests, from the most detailed assemblies to projects of the grandest scale. Whether you need us to manufacture the parts for your package, or just take care of the assembly, we will work hard to meet and exceed your expectations. At B&T Assembly & Packaging we will put our years of creative engineering and manufacturing experience to work for you. 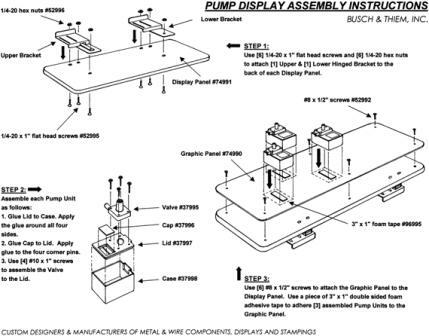 If you need wire framing developed for a particular display or custom woodworking to transport your product, our assembly packaging service can cover it. No matter what kind of work needs to be done to build your assembly, we have the tools and personnel to handle it. Moreover, our assembly packaging services can save you money. If you have parts coming in from all over the world, you can send them straight to us and we will perform the inbound quality inspection on premises so you don't have to pay for shipping twice. Then, once we finish your assembly packaging job, we can drop ship it for you, saving you more money and time in the process. If you want to simplify your assembly packaging needs, B&T offers the quality service and craftsmanship you can count on. Moreover, our flexible nature and the expertise of our packaging assembly team will ensure that your deadlines are always met, no matter how difficult.